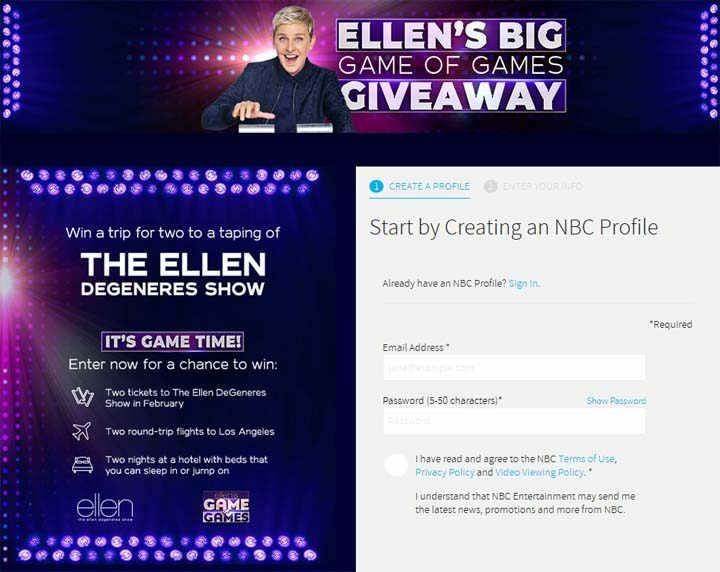 The Ellen’s Big Game of Games Giveaway (nbc.com/ellensweeps) is open only to permanent, legal United States residents who are physically residing in one (1) of the forty-eight (48) United States or the District of Columbia (excluding Alaska, Hawaii, Puerto Rico, Guam, the Virgin Islands and other United States territories), and who are eighteen (18) years of age or older and of the age of majority in their state of residence. 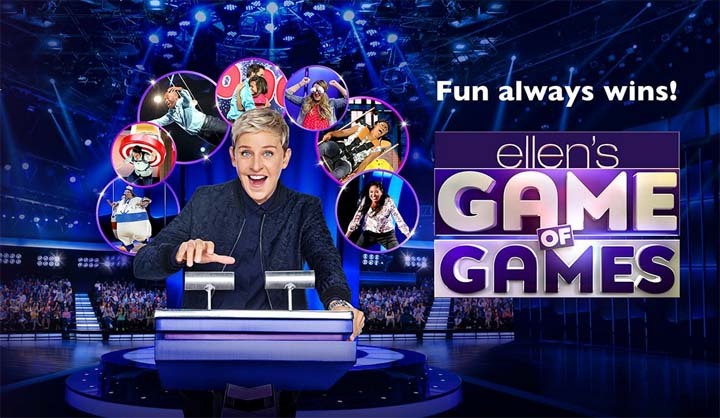 The Ellen’s Big Game of Games Giveaway ends on January 31 at 4:00 P.M. PT. To enter the Sweepstakes, visit nbc.com/ellensweeps, click on the Sweepstakes entry form, and follow the provided instructions to complete, and thereafter submit, the entry form. You may enter once per day. There will be one (1) prize awarded to Winner. Prize will consist of the following: one (1) trip for Winner and one (1) guest to Los Angeles, California to attend a taping of The Ellen Show. Trip will include: round trip, coach class air transportation for Winner and Guest from a major commercial airport in the United States nearest Winner’s residence to a Los Angeles area airport in Los Angeles, California; two (2) night hotel accommodations for Winner and Guest in a standard/double occupancy room in a Los Angeles hotel; exclusive ground transportation to and from Airport and Hotel; one (1) one hundred dollar ($100) Uber gift card (may be substituted with a one hundred dollar ($100) check if Winner does not have Uber); one (1) one thousand dollar ($1,000) VISA gift card for Winner; and, two (2) tickets for Winner and Guest to the taping of The Ellen Show scheduled to take place in February at the Warner Bros. Studio, located at 4301 W Olive Ave, Burbank, CA 91505. Estimated Retail Value (“ERV”) of Prize is three thousand five hundred dollars ($3,500). $$$ it would be nice.